Hong Kong might be ranked the fourth best city in the world in which to do business, yet business-jet operators are finding it increasingly difficult to gain access to its airport. Business aviation movements are handled at the airport by the Hong Kong Business Aviation Centre (HKBAC), which has a facility on the edge of the airport that includes an FBO and three hangars capable of holding aircraft up to ACJ and BBJ size. In 2017, the airport handled just over 72 million passengers and 420,630 aircraft movements, with only a small number of these being business aircraft. Because the airport is so saturated with commercial flights, business aircraft movements at the airport have been falling. They had been slowly rising, having reached a peak of just over 7,500 in 2016. But by 2017 the total number of business aircraft movements had dropped by 30%. The drop-in private or business aircraft movements is due to the difficulty of getting a runway slot to use the airport, not to a lack of demand. Because of the saturation of the airport by commercial aircraft, the Civil Aviation Department, and the Hong Kong Airport Authorities designed a joint application system in September 2016, which aims to ensure that the limited numbers of daily slots available to business aviation users are fully utilised. Currently around 30 slots per day available to business aircraft. Recent changes have been made to the slot-allocation process, with more aircraft able to use the limited number of night-time slots that were available. This was partly thanks to the efforts of the Asian Business Aviation Association (AsBAA) which had been working closely with the airport authorities to get better access to the airport for business aircraft. Jenny Lau, the president of locally based operator Sino Jet, is also the chairperson AsBAA. Ms Lau and the association that she heads have been lobbying for more access to slots for business aviation users at Hong Kong’s new Chek Lap Kok airport. “We used to face a very tough scheduling system, where we were short on slots, we were short on landing permits and parking spaces. We were very restricted and very limited “ says Ms Lau. Prior to AsBAA’s lobbying, only the Gulfstream G650 series of aircraft was allowed to use night slots because of noise restrictions. In 2017 usage was opened up to the Gulfstream G500, G550 and G650, and to the Bombardier Global 5000 and 6000 series aircraft, with a further shift in 2018 to include all business aircraft types. Whilst the increase in slot availability is welcomed, it is a short-term solution to a long-term problem. According to its 2017 Year-End Fleet Report, Asian Sky Group (ASG) says that 139 business jets were based in Hong Kong at the end of 2017. And that figure has been slowly increasing, with 2017’s 139 aircraft being an 8 per cent increase over the 129 aircraft there at the end of 2016. The aircraft that are based in Hong Kong are mostly large-cabin, long-range business jets. The most popular types are the large-cabin Gulfstream types, with the G650 / G650ER being based in particularly high numbers. Overall, ASG say that there are 72 Gulfstream aircraft based in Hong Kong. Bombardier has the second highest number of aircraft, with a total of 52. According to the ASG report, of the 139 aircraft based in Hong Kong only 6 aircraft are mid-size, with all of the remaining ones falling into the large-size category and above. Those large aircraft belong to some of the world’s wealthiest people. Hong Kong is home to an ever-expanding number of billionaires. According to Wealth X, in 2017 Hong Kong added more billionaires than any other city and will overtake New York as the billionaire capital of the world in the next few years. One fear that those in the business aviation industry in Hong Kong have, is that those billionaires could start looking to relocate if they are unable to use their private jets as intended. Hong Kong is one of the world’s most globally connected cities, with an unrivalled regional network. Charter operators have said that in the past that they have been unable to gain suitable slots for business aircraft movements, which has forced their clients to use the alternative of regular scheduled airline services. The airport’s slot situation will be alleviated to a certain degree in several years’ time when a third runway becomes operational. The project to add the third runway began in 2016, following five years of public consultation. Land for the new runway, known locally as the north runway, is due to be reclaimed from the sea by 2020, with the new runway becoming operational two years later. Hong Kong has been linked with Guangzhou and Shenzhen on the Chinese mainland by train and fast ferry for many years. Macau is also linked by ferry. 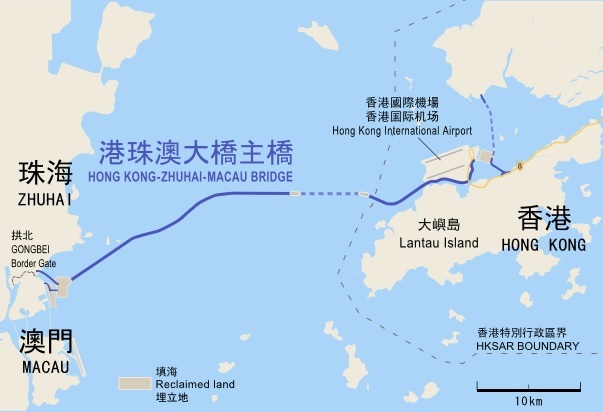 But last month a new bridge linking Hong Kong with Zhuhai and Macau was finally opened after a nine-year construction project that was beset by a legal challenge on the environmental impact of the bridge. The $18.77 billion bridge is effectively several different links. The first, and longest, section links an artificial island built close to Hong Kong’s airport with an artificial island close to Zhuhai on the Chinese mainland. From there, a smaller bridge links Zhuhai with Macau. The main section of the bridge is both the world’s longest sea-crossing by road and its longest fixed link between two countries, with the total length of the main section reaching 29.6km. With the link in place, there are hopes that more of the air traffic in the area around Hong Kong can be shared around its airports. Ms Lau talks about this in detail, saying that as the cities around Hong Kong are becoming ever more connected, there is a case for the air traffic in the area to be spread out across the airports. The idea is straightforward enough. With so many cities being so close together, Ms Lau says that one airport could focus on freight flights and one on low-cost carriers, as a way to alleviate some of the pressure on Hong Kong’s slots. Although this idea would help, it could have a negative impact on the individual economies of the various cities. Hong Kong has a thriving cargo market and currently sits in the top spot globally as the largest air-cargo centre. In 2017 it handled five million metric tonnes of cargo, representing year-on-year growth of 9.4%. To take that away from Hong Kong, or even to take part of that away, would make a significant dent in the local economy. So, whilst business aircraft could get more access to the airport, the loss to the local economy would far outweigh the positive benefit it could have for business aviation users. When asked if there is one thing that could help the situation, Ms Lau says that it would be to build a second airport in Hong Kong. It is something that Ms Lau has clearly put much thought into, saying that it is something she could only dream of. “If there’s any land, even between Hong Kong and Shenzhen that we can develop for another airport, maybe even to be utilised by both cities, that might be an idea” she says. Rather than just dreaming, Ms Lau says that she has already spoken of this with the management team at Shenzhen airport, who thought it would be a great idea to work together with Hong Kong on a new airport. http://aptechsoft.com/audition/prodad-mercalli-4-sal-software/ Hong Kong gateway to China? Hong Kong is among the world’s most important cities — as a financial hub it rivals New York and London, and its unique position at the head of the Pearl River Delta makes it an important transport and logistics hub. Although Hong Kong’s population stood at 7.39 million at the end of 2017, its proximity to the Chinese megacities of Shenzhen and Guangzhou make it an attractive option for access to those cities. China’s Zhuhai and Macau, although smaller in size, are also within range. Adding the populations of Shenzhen, Guangzhou, Zhuhai and Macau into Hong Kong’s takes the population of the city’s immediate hinterland to 36.6 million. Add together the whole population, including the area’s outside the megacities, and the population jumps to over 120 million. With such large catchment area, each of the cities has its own airport, with the airports in Hong Kong and Guangzhou appearing in the top 20 busiest in the world in 2017. Combined, all airports in the area handled just over 198 million passengers in 2017. With so many passengers passing through the area, and the airports in the area being so close together, it can cause issues in the skies. That’s especially in the case of Hong Kong and Shenzhen, which are a mere 24 miles or 40km apart. Alongside the high number of passengers passing through, the area is also used heavily by cargo airlines. Although China’s Yangtze River is the country’s lifeline, the Pearl River and the cities around it play increasingly important roles in China’s global expansion. Shenzhen can be seen not only as the tech capital of China but also in some respects that of the world. It is home to some of the largest companies that you might never have heard of, companies that are pushing technological boundaries forward in consumer electrical goods including televisions and cell phones. It is estimated that just above 90% of the world’s electronics goods are manufactured in Shenzhen, and once they have been boxed, they need to be sent out across the world. Hong Kong’s Chek Lap Kok airport is among the most internationally connected airports in the world. It is also one of the most heavily congested. Although the airport was only opened in 2008, replacing the iconic single runway Kai Tak, Chek Lap Kok quickly became one of the busiest airports in the world. Named after the red perch fish that the island resembles, Chek Lap Kok is a dual-runway airport built on land especially levelled for it. It is home to Cathay Pacific, which is regularly voted as one of the world’s best airlines, as well as to low-cost carrier Cathay Dragon. Other airlines that call Hong Kong home are HK Express, Hong Kong Airlines and Air Hong Kong.